The latest Vi5000 digital mixing console delivers the best Vi sound ever, bringing optional 96kHz processing, upgraded channel counts and even more reliable hardware to live sound's most popular mix interface. In the heat of the moment, with the faders flying, fader layers can cause all kinds of headaches. Soundcraft®FaderGlow solves the problem associated with multiple fader layers. At a single glance, illuminated-fader-tracks-in-colours that match those on the Vistonics™; display show immediately what function a fader is controlling. Within the output section of the console, the bank of 8 faders can be assigned to provide master control of matrix outputs, VCA groups and graphic EQ control. FaderGlow applies cyan, blue and red illumination respectively to the fader track, enabling the operator to see the different output types immediately – even before reading the text labels for each fader. When controlling inputs, no illumination is applied to the motorised faders. But when the Aux, Group or Matrix bus master is soloed with the Follow Solo function switched on, the fader becomes a ‘contributor’ for the soloed bus, lighting up in orange, green or blue accordingly. Furthermore, custom fader pages can be created to contain, for instance, 10 drum faders grouped on a single VCA master, which would glow in blue. Vistonics and FaderGlow are just part of what makes Vi Series digital consoles such intuitive and creative tools. Every aspect of the control surface, mechanical and operational, has been engineered around the operator to provide an unimpeded workflow and a more creative mix. By optimising the density of faders and controls on the operating surface, the engineer is able to reach all critical areas of the console comfortably from a central point, without straining or leaning over. The angle of the touch screens ensures that the engineer can always view display data clearly during the show. The brightness and contrast of the displays, and the illumination of the control surface itself, are designed to minimise strain on the eye. User-configurable fader layers allow an engineer to map out channels on any of 5 user layers so that a combination of different inputs can be placed on one layer. This allows, for example, the main vocalist mics to be programmed to appear in the same location on every layer, or other essential channels to be brought closer to a central operating position. At a festival, each engineer can quickly assign to the surface only those channels needed for their band. Output fader layers can also be customised, for example, stereo aux masters can be placed alongside VCAs or matrix masters for faster access to the most used outputs. No button pushes or page scrolling - just one touch of the Vistonics screen gives you instant access to every aspect of the Vi channel strip. Each Vistonics screen functions both as a permanent overview of all the current settings (8 channels per screen), and as the access point for immediate hands-on control of any of those settings. Simply touching the screen in one of the six vertically stacked touch zones immediately opens out that part of the strip onto the 16 real knobs and switches mounted directly on the lower part of the display, allowing immediate, tactile, analogue-style control. The colour-coded context-sensitive graphics around the knobs make it abundantly clear which type of function is being adjusted, and a clear white highlight is a constant reminder of which channel is being controlled. Touching the screen again is all it takes to move to another area of the channel strip, or to close the control area. Software control - rapid configuration and powerful automation. Save time. Save money. Save your neck. Whatever the show, the Vi operating system is designed to dramatically reduce set up time and protect every critical setting with enhanced data security in the event of power failure. Familiar Copy/Paste functionality allows the settings of any channel, bus, FX section or processing element to be rapidly copied to any number of other channels, saving set up time and helping eliminate errors. The last paste operation can be quickly reversed with an UNDO function. Blocks or individual parameters within a channel are selected for copying via touch screen selection on the same intuitive Vistonics screens that are used for audio control functions. Advanced Library functionality allows a user to select any set of parameters in use on the desk, for example a single channel EQ setting or a group of channels set up for a drum kit, to be stored in the internal library and recalled at will. These libraries can be exported to, or imported from, a USB memory stick, allowing users to build up their own portable channel and processing libraries that can easily be transferred to any other Vi console. This is done independently of the Show Files which already allow entire desk settings to be exported. Within the software are a number of useful libraries of EQ and Dynamics settings to suit common applications. In the event of mains power to the surface being interrupted during a show, the auto-backup system ensures that the last settings of the desk will be retained and restored automatically when power is restored, meaning no changes to the audio - or the set up. 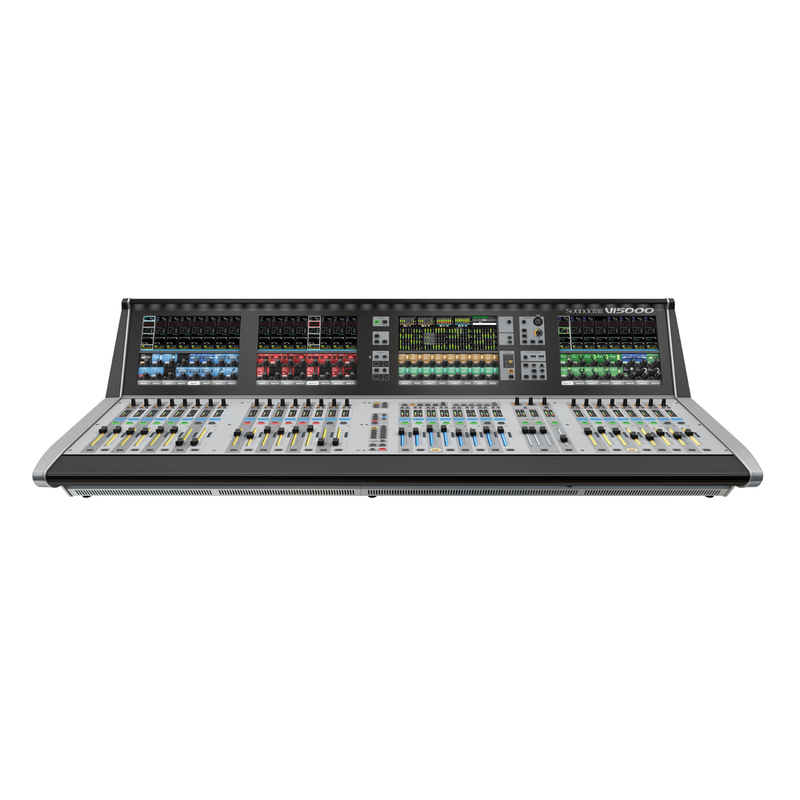 In addition, the Vi control surface can be switched off, disconnected or rebooted without any interruption to the audio in the Local Rack. The Local Rack incorporates an extremely fast boot time, returning the audio to its previous state within 10 seconds of a power cylce, with or without the control surface connected. Vi Series consoles are packed with powerful automation features which place the operator in total control of the show. A sophisticated Cue List Management suite includes an Apply Changes function, where parameter changes can be applied to multiple snapshots, and cues can trigger or be triggered by MIDI or GPIO events, including MIDI Timecode. Harman’s HiQnet Venue Recall function is tightly integrated within the Cue List. Theatre users will welcome sophisticated snapshot filtering. In addition to a conventional Isolate function where a channel may be isolated from snapshot recall, it’s also possible to apply high-granularity recall filtering both globally and on each snapshot, right down to parameter level – for example, a Pan setting or an individual Aux send. Also important in theatre applications is the facility for snapshot recalls to use crossfades to smoothly transition from one setting to the next. A snapshot preview mode allows the engineer to check in advance what settings are about to be recalled, and also allows editing of other cues without affecting the audio. Saving prep time and letting you set up your shows offline, Virtual Vi software is the fast and easy way to create scenes and store to USB ready for loading directly into the Vi5000 or Vi7000 console. The Virtual Vi software also allows direct online control of the Local Rack’s DSP engine, in the unlikely event that the control surface should fail. The ViSi remote app gives you control over all major mixing functions, empowering operators to mix from anywhere in the venue. Check the FOH from audience locations, or adjust monitor mixes direct from the performers’ positions on the stage. 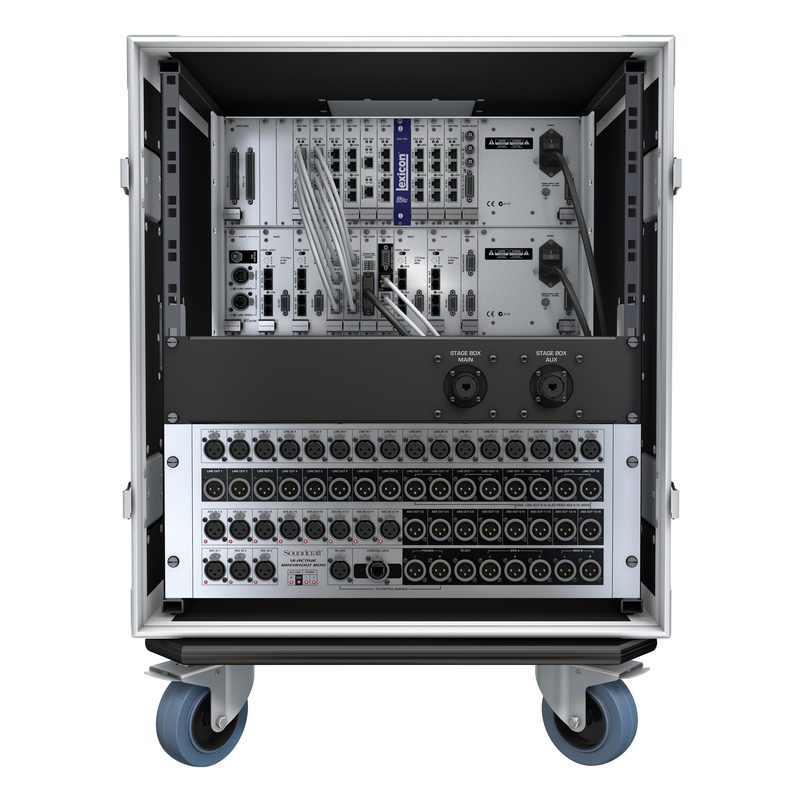 The latest incarnation of the Local Rack boosts I/O up to 384 and is loaded with additional card slots to allow simultaneous use with two Stageboxes, 2 recording cards and the Realtime Rack MADI interface. 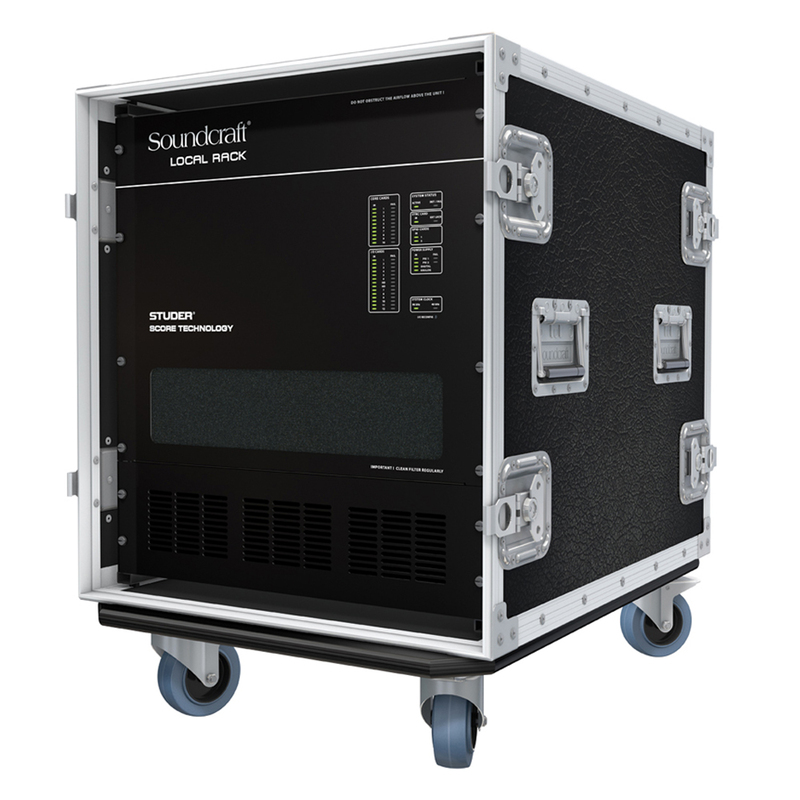 Cat5 or Cat7 cables with Amphenol RJF connectors provide a convenient, highly robust connection between the Soundcraft Vi SeriesTM stageboxes and local rack enabling the mixing position to be located up to 100 metres from the stage. And in larger venues and installations, an optional Fibre Optic interface allows a run of up to 1.5 kilometres between the stagebox and the local rack. A comprehensive provision of inputs and outputs can be patched to any channel input, direct output, bus output or insert point as required. The local rack has 16 analogue line inputs, 3 analogue mic/line inputs, a talkback mic input (mounted on the control surface) and 8 pairs of AES/ EBU inputs. Outputs include 16 analogue line, 8 pairs of AES/EBU, 3 LCR local monitor A line, 2 LR local monitor B line and TB line. The standard Vi stagebox houses 64 analogue mic/line inputs and 32 analogue line outputs, with 48V phantom power and a 100Hz HPF before the A-D converters. Mic amp gain can be controlled remotely from the control surface. Optional AES/EBU inputs and outputs are available for the stagebox in sections of 8, as are optional cards for a wide variety of audio interface standards including Dante, Blulink, Cobranet, Aviom A-Net16 and Ethersound. 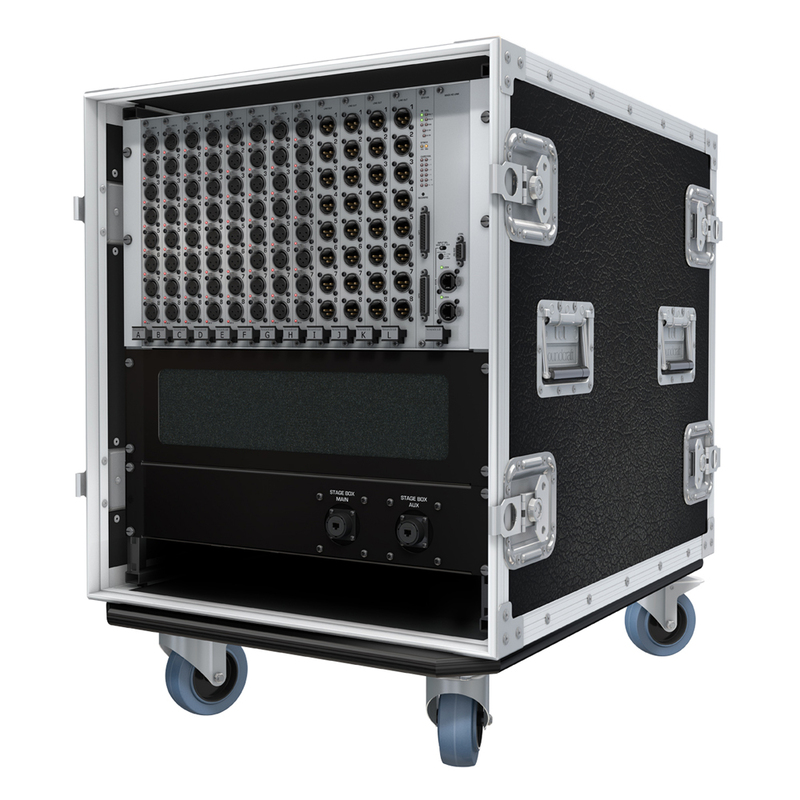 Up to 5 stageboxes can be connected to create a digital patchbay, where the operator can select the sources for the 128 inputs to the console from a selection of inputs available on any of the connected stageboxes. In addition to the 64-input Stagebox, Vi5000 and Vi7000 consoles can also be used with the smaller Compact Stagebox (32 or 48 inputs) or the Mini Stagebox MSB16 or MSB32, where I/O needs to be expanded in space-restricted environments. A series of optional interface cards, designed to fit either the local rack or stagebox, enable Vi Series™ consoles to directly interface with a wide range of other systems and audio networks using industry standard protocols.